The last week of July found me on most mornings observing and photographing the many spiderling plume moths that were flying around and perching on a patch of red spiderling plants in our yard. It was a fitting coincidence that this was also National Moth Week. I had first seen and identified one of these moths four summers ago while photographing red spiderling plants, which are also called wineflower. The odd-looking thin sprawling plants that periodically appeared in the yard around the house are Boerhavia diffusa, a fact that I learned reading a Treasure Coast Natives blog post. Red spiderling is a member of the four o'clock family (Nyctaginaceae) of plants and closely related to bougainvillea, which has similar-looking but much larger flowers. My moth week observations of these tiny plume moths – they have a wingspan of about a half inch – included all four main life cycle stages: eggs, larvae (caterpillar), pupa and adult. Spiderling plume moths are tiny, with a wingspan of from an half to three-quarters of an inch. In flight they look like little tufts of down floating around in the air. At rest, they exhibit the classic plume moth 'T' shape of each wing bunched together and held perpendicular to the body. The wings are deeply divided, the forewings into two lobes and the hindwings three. A fringe of threadlike scales give the appearance of the wings being feathered, hence the name 'plume'. The legs have perpendicular thorns, most apparent on the long hind legs held along each side of the abdomen when at rest. Published observations of these and related species recorded that eggs are laid on the tips of branches near the fruit. I saw eggs in this location and also on the bottom of one leaf. The caterpillars feed mostly on the unripe fruit of spiderling, but also on many plants in the four o'clock plant family. In south Florida the larvae will feed on the leaves of the rare Okenia hypogaea known as beach peanut. Megalorhipida leucodactylus do not build cocoons, they simply pupate attached to the host plant and leave the cast skin of the larval stage (the exuvia) attached along the stem at the base of the pupa, which is about a third of an inch long. 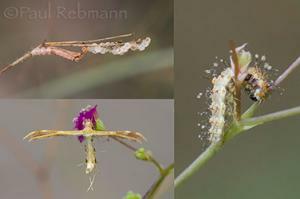 In Florida spiderling plume moths have multiple broods throughout the year, but are mostly seen July though January.